Driven by easy-to-consume infrastructure and services, the adoption of public cloud surged in 2018. As a result, enterprises are seeking cost management solutions tools to curb waste, optimize cloud costs, and increase transparency. However, businesses must also factor the cost of licensed software into this equation, otherwise they may leave significant savings on the table. 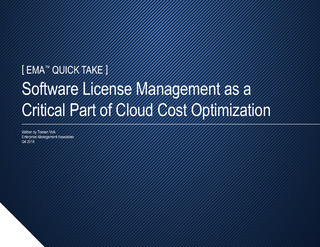 The “”Software License Management as a Critical Part of Cloud Cost Optimization”” white paper by industry analyst Enterprise Management Associates explores the consequences of not considering software license costs when deploying in the cloud and pinpoints why it occurs. Download the white paper to learn how.